This tutorial shows how to use DataSnap connector in the Smart Mobile Studio Enterprise. Firstly, create a DataSnap server. In this example we are using Delphi XE7 but any older version will be OK as long as it can create a REST server. Start by creating new project. 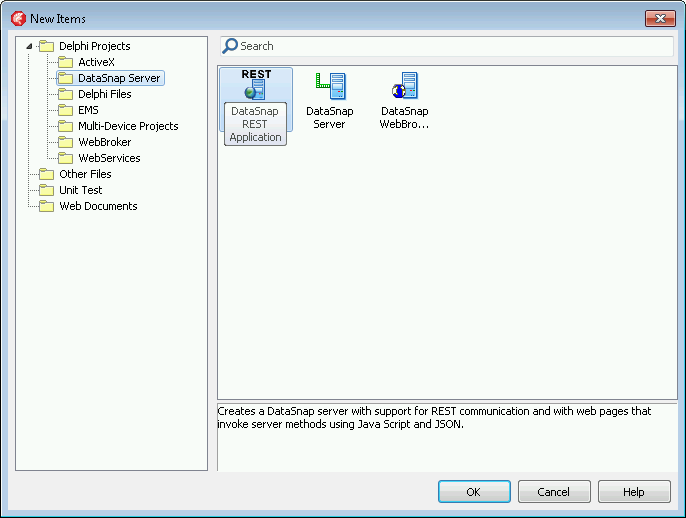 Select DataSnap REST Application from the DataSnap Server branch. It is important to create REST server as Smart doesn’t work with binary data format used in MIDAS-based DataSnap server. Besides a bunch of fixes, Smart 2.1.2 introduced a new unit, SmartCL.Inet.REST. This unit greatly simplifies writing REST clients in Smart. A simplest way to introduce it is with an example. Let’s say we have a REST server listening at http://someserver/hbbtv/streamevents. It supports one request – PUT – and three parameters – applicationid, eventid, and eventdata. To send a request, one would just open a HTTP connection (TW3HttpRequest would do that for you in Smart) and send something like http://someserver/hbbtv/streamevents/applicationid=1&eventid=233&eventdata=Test (or http://someserver/hbbtv/streamevents/1/233/Test if your REST server is not completely braindead). Still, you would have to set up the TW3HttpRequest object, concatenate the URL and parse the response. And whenever you write some code, there’s an opportunity to introduce a bug so it’s best if you code as little as possible. The REST client for the example above can be written in one statement.